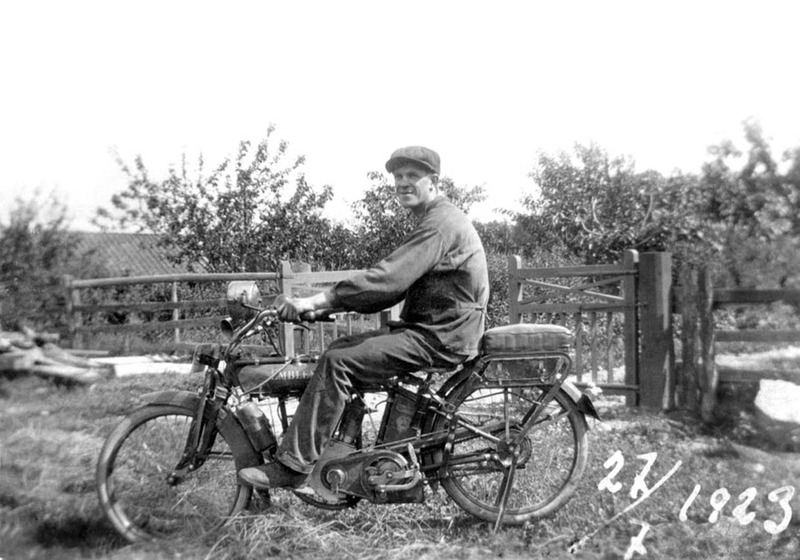 This old Swedish photo show a bike different from those more ordinery HD`s an Injuns. Emblem is one rare bike today, once made by Emblem Mfg. Co., Angola, Erie County, New York. A company started in 1909 by William C. Schack and William Heil. The Emblems where initialy sold with engines from Thor, but along the way they came with Emblem made engines. Starting up with a single cylinder Emblem soon offered a 1255cc V-twin, named the Giant twin. Their sales slogan where; Class-Power-Speed & Satisfaction and indeed did they have a god reputation on their bikes due to its god quality. The pictured bike is a 1917-18 Emblem Little Twin of only 532cc displacement. Emblems where sold in the US from 1909 to 1918 but the depression caused by WWI got them as many others into financial problems leading to an end of their production. According to my investegation their remaining stock of bikes where shipped of to Europe where the bikes where sold as late as 1925.